Customer service bots powered by AI algorithms are going to be a game-changer. But there are many things only humans can do. The two can work together. Not too long ago, a friend of mine pulled out his phone to stream from the cloud the hoverboard scene from Back to the Future 2. He said “We should have had these in 2015! Why aren’t they here. What kind of future is this?” It was sort of a weird conversation, since he was using remarkable, jaw-dropping, world-changing technology to complain about not having a pretty useless gadget. But that’s pretty normal. Once we have technology, we quickly accept it as “the present” instead of an amazing future. It’s the same with robots. They don’t seem to be everywhere, but just because we aren’t in Westworld doesn’t mean we’re not pretty consistently interacting with robots. When it comes to customer care, robots are already becoming your best friend. Bots are able to interact with customer and clients in realistic, seamless ways. They are working through apps and chatboxes in order to streamline your customer service. But they aren’t replacing your employees. Rather, bots are able to handle the easier questions and more simple problems so that your employees can deal with the tough ones. Bots will free time to handle the delicate and unexpected problems. They free people to take care of issues that an algorithm couldn’t ever understand, no matter its power. By handling the predictable, AI-driven bots improve your call center. That’s a future I’m glad to be present for. Chatbots are AI algorithms designed to interact with customers in a way that mimics human intelligence. This doesn’t just mean a robotic voice clanging out “He-LLO Miss-us SM-ith”. The bots are able to actually communicate, answering questions, providing guidance, and making sugesstions. They can do everything from pick out makeup to plan trips to walk a customer through a sales or service issue. These algorithms are incredibly effective, too. Look at the Sephora example above. It’s the human who is giving one-word, almost robotic answers. The AI is actually acting warm and friendly. And that’s not a critique of the customer. They are able to save time by talking to a system that truly understands them. Marketing tool to increase engagement. If a bot can respond intelligently to a tweet with a personalized message, is it really a bot? Provide content. We’ve talked about using content to enhance customer service. A bot can have every video, graphic, blog post, and white paper memorized. It can steer customer the right way. Handle purchases. A customer’s online and in-app purchases can be handled by a bot, who can answer questions, steer them toward products, give recommendations, and facilitate every aspect. Streamline interactions. Should you be on hold for 10 minutes to talk to someone who is going to tell you to reboot your system, when a bot could do that instantly (and reboot the system automatically themselves)? Of course not. Nor should you tie up customer service to do something that can be done nearly autonomously. That’s where chatbots come in. There are going to be more and more uses of bots in customer care, as they become more sophisticated and more part of the app ecosystem. But will they replace customer service? Of course not. 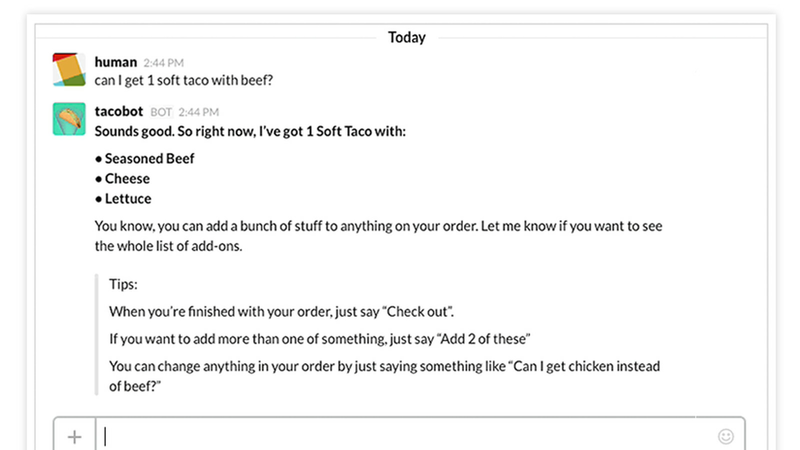 Taco Bell uses Slack to place orders. That’s great for a food joint, but what happens with bigger issues? We’ve talke a lot on this blog about how customer service needs to be more human, and we mean that. That doesn’t mean being afraid of technology, though. Technology is extremely helpful, which is why your third-party call center partner needs to be on the cutting edge of technology. We know the future is bots. Look at some of these numbers. So it is growing. But do peopl always want to talk to bots? Well, interestingly, bots can help with humanization, with their human mimicry. But it is more than that. I think people are fine interacting with bots on the easy stuff. “My cable is out, why?” can be met with a quick “service in your area” rather than waiting on hold. But there are always more complicated items. There are problems that are unique to the caller that an algorithm can’t fix. There are issues that require empathy and creativity. There are customer issues that only someone who has been a customer, who has been on the other side, and who can walk a mile in their shoes, can handle. That is to say, a person. With chats, though, that person won’t be overtired from dealing with 100 minor, easily fixable problems. They’ll be able to focus on the difficult problems, devoting more time to people, engaging in more hand-holding, being able to interact over multiple channels. There can be more training, and more guidance. All of this, from the bots to the people, will make customer care better. That will make for a better experience for everyone, driving customer loyalty and improving employee morale. The future isn’t what we always wanted. It can be even better.